The kind of down-home food truck we can get behind. 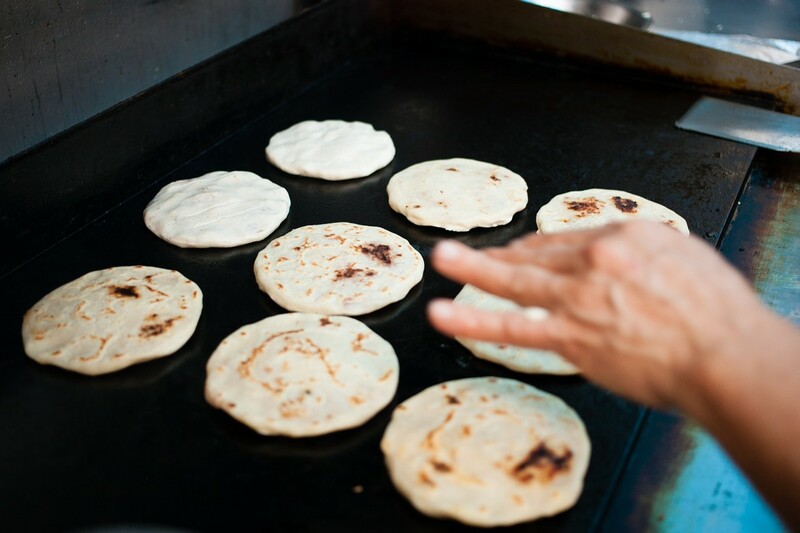 Each pupusa is formed by hand before griddling. Hours: Mon.–Thu. 9:30 a.m.–5:30 p.m., Fri. 9:30 a.m.–3 p.m.
Is it okay if I say I'm a little bit tired of bougie food trucks? That I've eaten enough fusion tacos and overpriced po'boy variants to last me a little while. This is nothing against the new school of food trucks that have bolstered the Bay Area's street-food scene for the past six or seven years. But for every FiveTen Burger or Liba Falafel-esque world-beater, there seem to be at least three or four mobile-food ventures that leave me cold — however slick the marketing. Look: When a food truck charges $15 for a fussy, microgreen-topped sandwich and expects you to wait in line for half an hour — well, let's just say we're no longer operating in the realm of the Modest Working Person's lunch. Against that backdrop, El Sabrosito, a new Salvadoran food truck and mobile pupuseria, is a breath of fresh air. 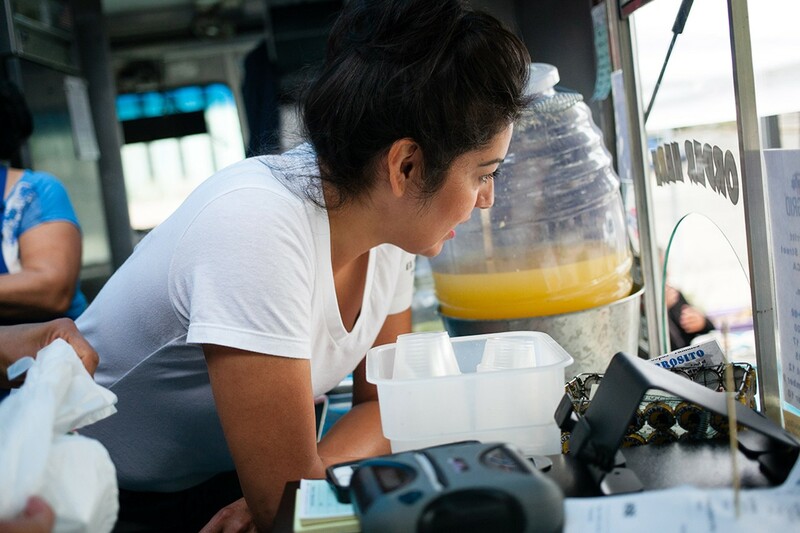 El Sabrosito is the brainchild of Maria and Claudia Zavala, two Salvadoran-born sisters who started operating the Oakland-based food truck this past December after running an informal catering business for about a year prior. Claudia is the main cook — the one who developed all of the recipes, which are mostly adaptations of home-style dishes that the sisters' mother and grandmother would make back in El Salvador. So far, the truck has been relatively overlooked in the hype department, partly thanks to its somewhat out-of-the-way location: Monday through Friday, it is stationed in a small parking lot outside the office of a nonprofit called the Jack London Improvement District at the corner of 4th Street and Broadway, with a couple of umbrella-festooned tables set up for customers who'd like to stay and eat. More recently, El Sabrosito has lined up a couple of higher-profile evening gigs: once a month at the Oakland Museum of California's Off the Grid event, and every other Friday outside Kingfish Pub in Temescal. It won't be long, then, until the word gets out: For my money, El Sabrosito is the most appealing new food truck to hit the streets in Oakland in the past couple of years. That's at least in part due to the fact that it doesn't feel like a new-school truck at all, but more like one of those old-school loncheras that still reign supreme in the Fruitvale district. The prices might be a smidge higher than you'd find at your neighborhood pupuseria, but for a food truck operating in Oakland in 2016, they're exceedingly reasonable: A single pupusa, which all by itself makes for a satisfying light lunch, will run you $3.25. 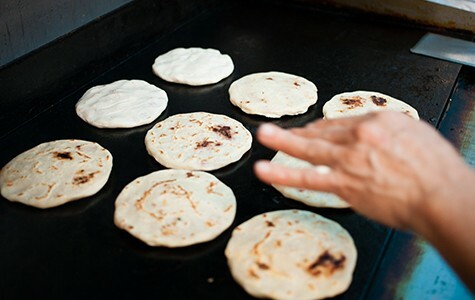 What I appreciated most, however, was the old-fashioned, home-style ethic of the place — the satisfying smack of the cook slapping fresh masa dough from palm to palm as she formed each pupusa to order before grilling it on the flat-top. These are fat, well-griddled specimens — each masa cake fluffy and flavorful, if perhaps a little thicker and not quite as crisp-edged as my very favorite versions. There's no bacon-wrapped pupusa on the menu here, no pupusa with kimchi. Instead, the truck offers the full slate of traditional fillings, my favorite of which was the chicharrón (pork) and cheese: melted cheese (whose exact composition is a proprietary secret, Maria Zavala told me) blended with shredded slow-cooked pork to form a kind of oozy, ultra-savory meat paste. Vegetarians can opt for a pupusa filled with cheese and shredded zucchini, or with cheese and loroco — a tangy herb indigenous to El Salvador. Cool your tongue with one of the truck's delightful frescos of the day — the Salvadoran version of an agua fresca. During my visits, these varied from a cool, cucumber-infused lemonade to a pineapple fresco loaded with chunks of fresh pineapple. It feels like a cliche to say so, but every time I ate at El Sabrosito, I was impressed with how so much of the food just didn't seem like the kind of thing you'd buy off a truck. Perhaps the best example of this was the bean soup: Salvadoran frijoles de seda (red beans) simmered slowly with a whole onion to form a broth that's at once richer and more intensely flavorful than you would anticipate from something made from such modest ingredients, but also lighter and less starchy than you'd expect from something called "bean soup." The best part: The soup is served topped with a big scoop of rice — so that eating it is akin to eating a comforting rice porridge — and cubes of soft, nutty queso fresco. You also get two fat, piping-hot tortillas that are hand-formed and griddled to order — pupusas without the filling, basically. This is the kind of homey repast I would expect to be served in someone's grandmother's kitchen — not at, say, Off the Grid. Don't be alarmed by the $8 price tag: You get a giant tub of soup that I've found to be enough food to last me two or three lunches. Another standout was the ceviche-like shrimp tostada, one of El Sabrosito's rotating selection of daily specials. I loved how delicate the shrimp were — barely "cooked," as they were, by the acid of the lime juice — and the fieriness of the well-balanced lime juice and habanero "soup." But the most delicious item at El Sabrosito might also be the most unassuming: a $2.75 Salvadoran-style chicken tamal that doesn't jump off the menu but, quite frankly, rocked my world. Many Bay Area diners are familiar with the various Mexican incarnations of these steamed masa bundles, but the Salvadoran version is its own beast: The masa is steamed in banana leaves rather than corn husks, so it has its own unique kind of fragrance. The filling is essentially an aromatic, slow-cooked chicken stew, studded with soft potatoes and green beans. But the best part is the masa itself, which is so jiggly and tender, quivering at the slightest touch, that the whole thing barely holds together. How do they get the masa so tender and flavorful? Details about steaming technique and the proportion of grain to liquid only reveal so much. All I know is that the dish had a soulfulness to it that won me over. This, I thought to myself — this is what street food is all about.